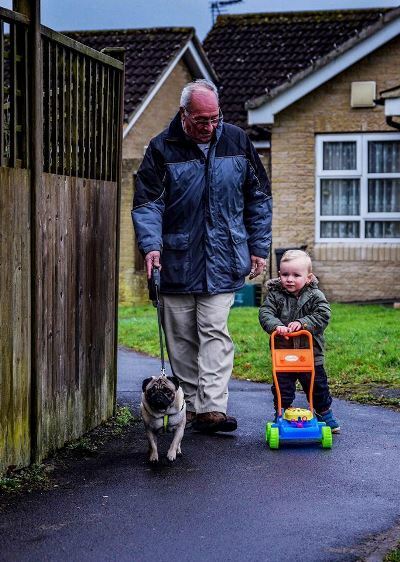 The son of a Keynsham pensioner whose pet pug suffered catastrophic injuries after being mauled by another dog says he is “lost for words” at the outpouring of support the family has received from the community. Well-wishers have donated more than £1,800 to pay for surgery for little Wills after he was attacked at the recreation ground near Carpenters Lane on the evening of November 19 by an Akita that had gotten loose. Wills’ chest was ripped open and his lung punctured while his 72-year-old owner Mike Tucker suffered bites to his arm and hand as he tried to protect his pet. Mr Tucker’s pug puppy Lucy escaped unharmed. Wills was rushed to the vet for life-saving surgery and Mr Tucker and his wife Carol now face a bill expected to be around £4,000 and ongoing medical costs, which their pet insurance will not fully cover. Wills’ suffering was particularly heart-breaking for Mr Tucker, said his son Stu, as the dog had been his “rock” as he underwent treatment for lung, lymph node and oesophageal cancer in 2015, from which he is now in remission. Mr Tucker has had Wills for over four years since he was a puppy. News of the attack soon spread among neighbours, fellow dog walkers and the surrounding community, where Mr Tucker is a familiar sight on his daily walks with his pugs, and offers of help began pouring in. Stu, who lives in Paulton and is also helping to pay the vets’ costs, set up an online fundraising page to go towards Wills’ medical care in the days following the attack and said his dad had been moved to tears by people’s generosity towards his “best friend”. He said: “My parents have had many little pugs as we grew up. My dad has been taking them all on the same walk for many years around the rec at the back of their home. This little dog means the world to my dad and has been his absolute rock while recovering from cancer. “Keynsham, you have been – well, to be honest, I do not know the words to describe what I need to say. But we truly are thankful and I’m very proud to have such a connection with heartfelt and compassionate people like you all. He said his dad has now been reunited with Wills, who is recovering from his surgery at home and has been out for a few short walks already. Police said the Akita also attacked another dog before it was captured by two passers-by. They said the Akita had been seized and inquiries into the incident are ongoing. Stu has thanked the two people who stepped in to help during the attack. He said once Wills was fully recovered the family hoped to be able to invite supporters to meet him and enjoy some tea and cake.